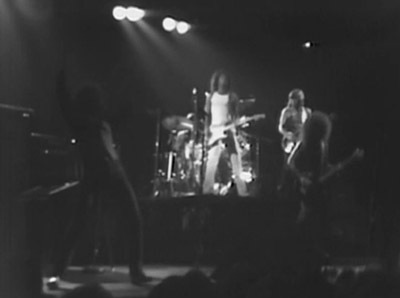 Check out these great pics we found at regionrockmemories.com of the Dictators in Hammond, Indiana, from Oct. 14, 1977. Our boys opened for BOC and Ram Jam (?!?) at the Hammond Civic Center. 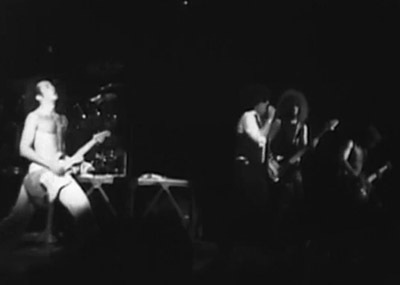 The recording of this show has been floating around Bootleg Universe since 1978, and either everyone in the band took exactly the same amount of Qualuudes at exactly the same time, or else the original tape ran a little slow, because the usual 35-minute opening set takes 39 minutes here. Thanks to Mike Vanagas for use of the pics. Until we hear back from the librarian at Prince George Community College, and we’re not waiting underwater for that to happen, we’re going to go with the assumption that this is the very first review our boys ever received. 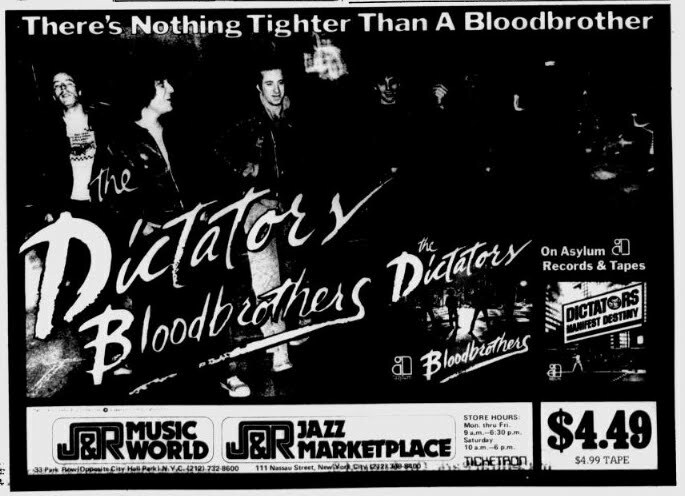 This beauty is from the Village Voice issue dated May 2, 1974, and it covers what looks to be gig #10 or 11 of the Dictators. “There’s no way for them to miss out on superstardom.” Sigh. Thanks and a tip of the miner’s helmet to our friends at streetsyoucrossed.blogspot.com, who did all the heavy archeological digging for us. 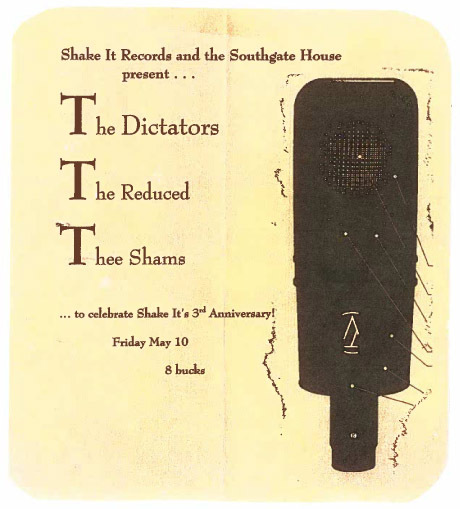 April 12 marked the anniversary of 1997’s star-studded Tom Clark Benefit at Brownie’s in NYC. 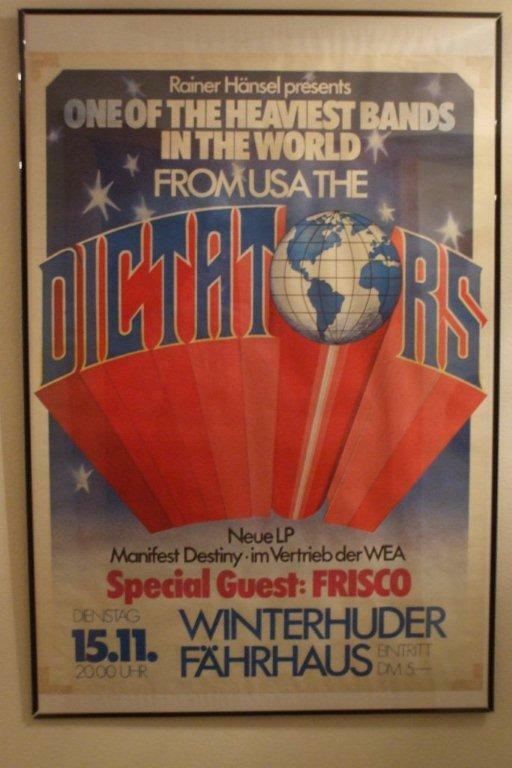 The DFFD Blog asked Dictators fan Adam Gerstein for his memories of the show. 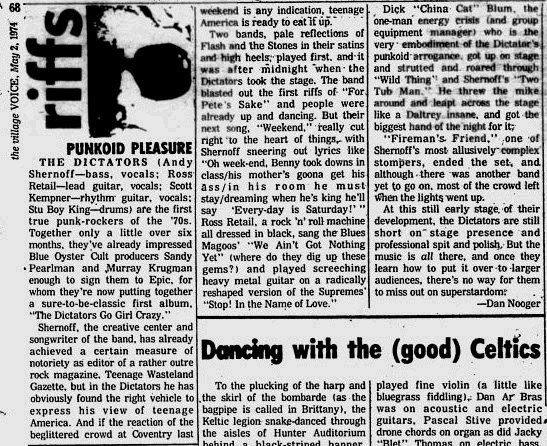 “Lenny Kaye was the first band that I saw last night. I used to see the Lenny Kaye Connection all over NYC and they were always fun. However, I always appreciated Lenny more of a backing musician with Patti rather than on his own due to the limited range of his voice. He put on an animated set and the interplay between J.D., Tony, and Lenny was great. Jim Carroll surprised the hell out of me. I have seen him stumble on many stages since the seventies, but last night he looked fit (hard to imagine) and healthy. Then again he never played with a band as good as the guys last night. In addition to playing with J.D., Lenny, and Tony, he also played with Adam Roth, who added tasty slide leads. “Catholic Boy” and “People Who Died” were the standouts last night and Carroll definitely impressed the crowd.